With two days to go till the end of 1917 (100 years ago), Thamesites must have been hopeful that no more bad news would be received from France. Alas there was one war death on the 30th and another on the 31st December 1917. Raika Murray of Kopu, was just 18 years of aged when he was Killed in Action. His name was also included on the Matatoki Roll of Honour. 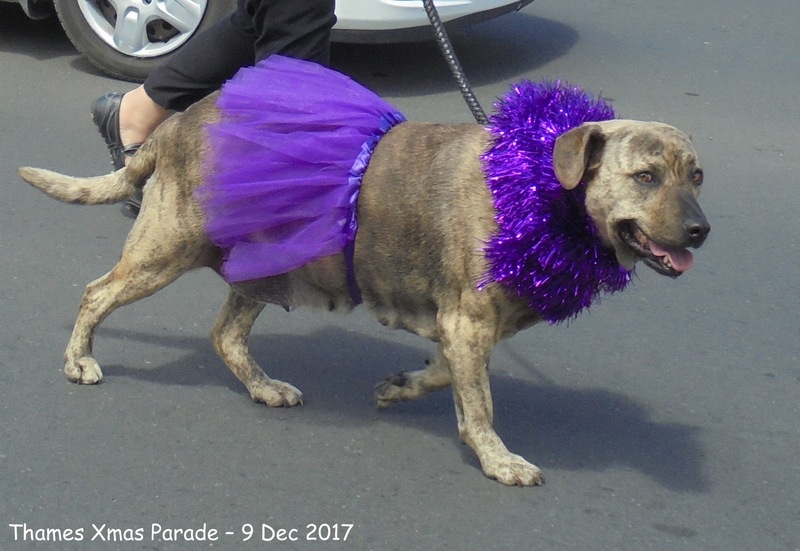 Raika's next-of-kin was Wikitoria Tengahue (mother), Kopu, Thames, New Zealand. 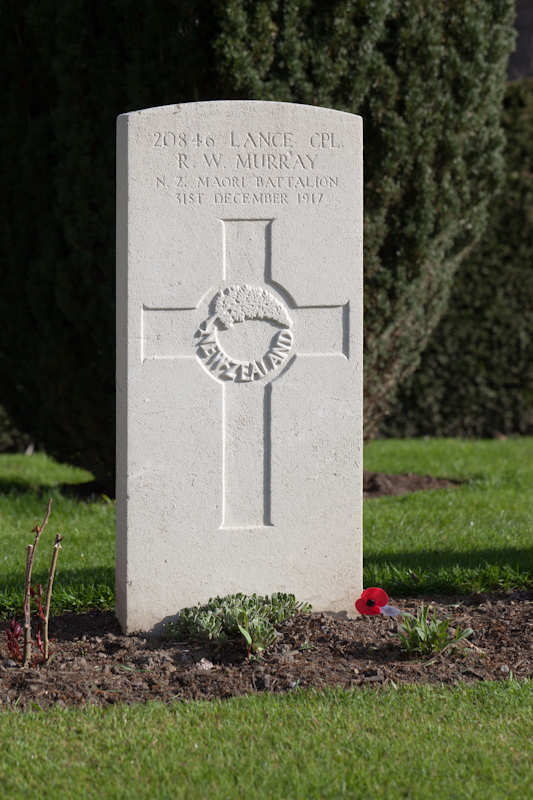 Corporal Murray is remembered in the Ramparts Cemetery, Lille Gate, Belgium. the boundary line between Shortland Town and Grahamstown. 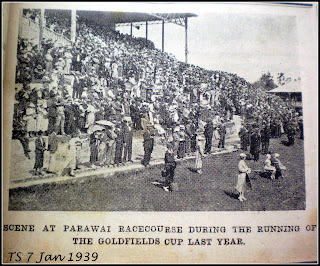 named after the Maori land owner Pahau who lived on and cultivated the land. 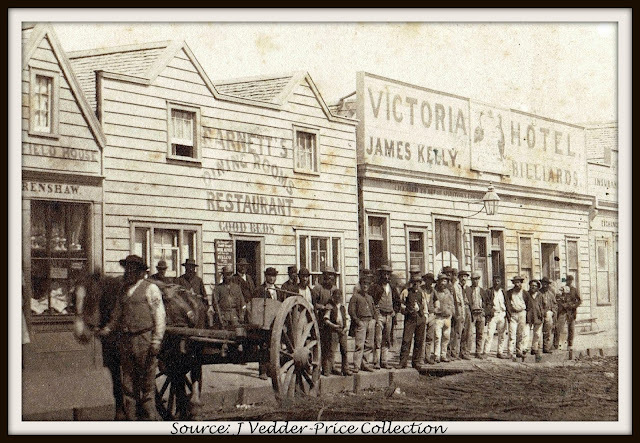 the Presbyterian Church was/is located on the Shortland Town side of the street - land purchased from Ngatiawa Pahau,. 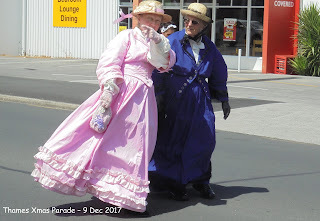 on the first maps Pahau Street ran from Bella Street (east) to the sea. By the 1910s, the street had been shortened and ended at Queen Street. 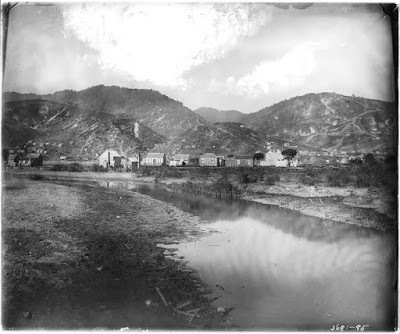 The postcard below was taken by Muir & Moodie in the 1910s. The view west of the Pollen Street intersect, looking towards Bella Street to the east. All the main landmarks remain. The Junction Hotel, The St James Church and hall. Plus several of the houses on the Bird-in-hand hill above Bella Street remain to this day. 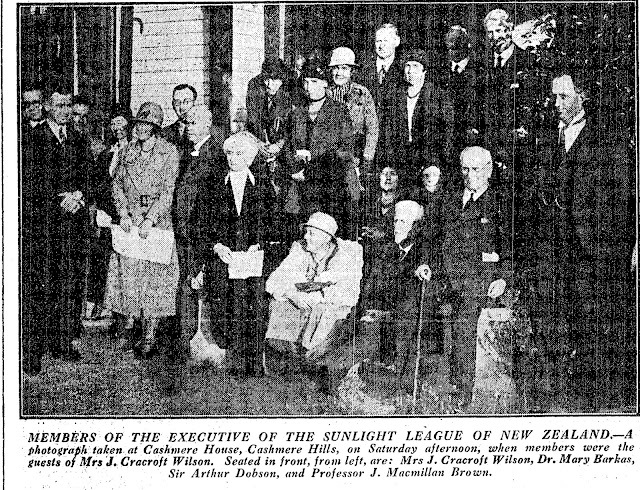 In the 1923 Street Directory the following people/businesses were mentioned for Pahau Street. 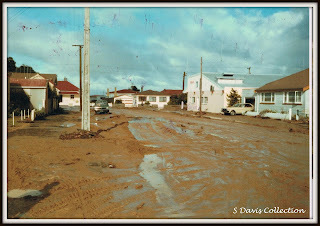 1985 - Pahau Street - the water has gone, the flood debris remains. 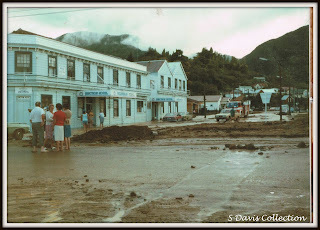 ABOVE Left: 1985 Flood - view along Pahau Street to the east - flood cleanup underway. ABOVE Right: The view looking west from the Pollen Street intersect to Queen Street. Well what a way to start Christmas Day. 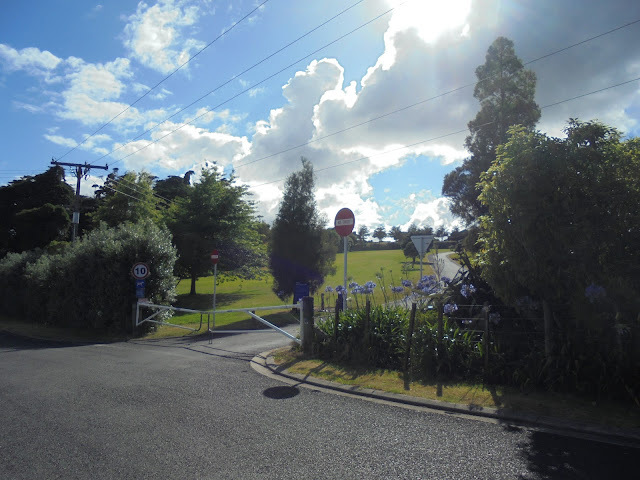 As we drove up the road to Totara Cemetery, there was a line-up of cars and people waiting along the drive. The problem? At 8.30am the gates were still padlocked! While it could have been possible for some to make the long trek up the hill, it was not a viable option for most of us. The Council were rung but no one came while I was waiting. Many cars turned around, hopefully to return later. Some ingenuity got us in one way at least. The next surprise came at the grounds of the cemetery itself. 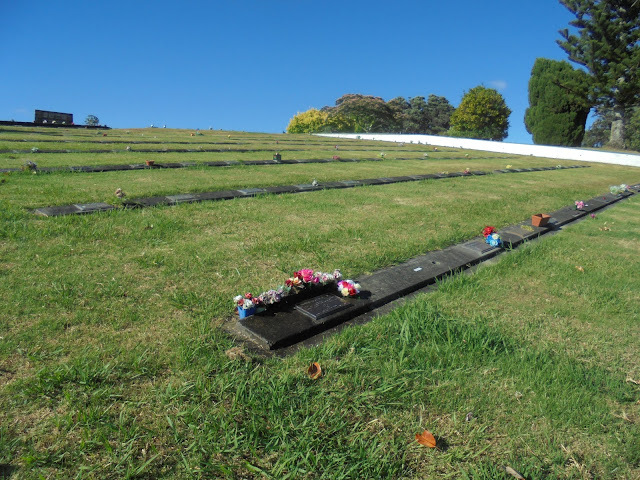 Normally Christmas Day is a pristine view along the 'beautifully' kept cemetery. Alas today many areas were deep in grass, and some hand pruning was necessary around the grave-sites we visited. PS. TCDC when are you ever going to replace the water tap at the tree opposite the RSA section. The sooner we get a "Friends of the Cemetery Group" going the better. Yes sorry for the rant. 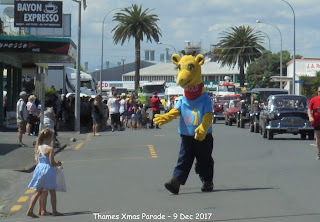 Greetings from Thames, New Zealand. 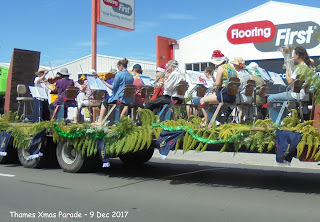 These days there is a decorated tree at Kuranui Bay for those that venture towards Tararu - but to older Thamesites things were never the same the day the old Chestnut tree was cut down. 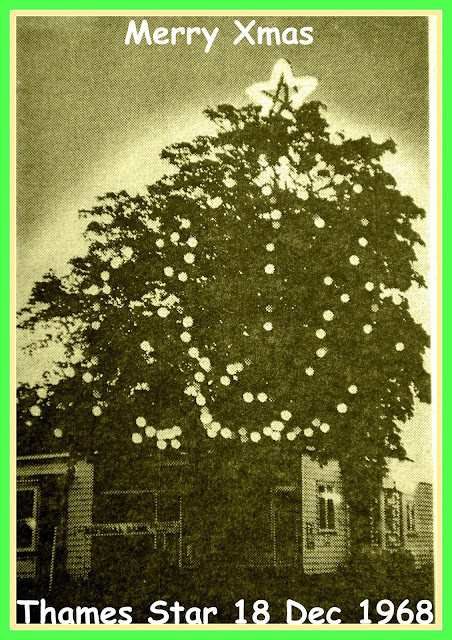 Young and old waited expectantly to see the tree at the corner of Mary and Pollen Streets, which was covered in lights every December. The magic was enhanced, because those were the days when late night shopping was an important social event. On Christmas Eve everyone would go down town, do last minute shopping, meet with friends and view the lights along Pollen Street. 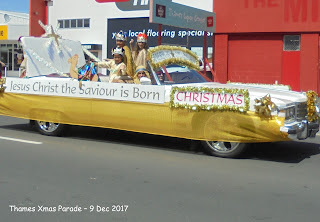 The photo below is from Christmas 1968. If you were stuck for ideas of what to buy, the newspaper suggested 'walking the Ladies Mile' aka Pollen Street. Drapery shops included Hetherington's, Court's, Cullen's, The Caledonian, and The Elite. Dunnage's and Coad's could meet all your stationery and book requirements. While the livery stables and garages in business were Hawkes', Phillip's and Shaw's. 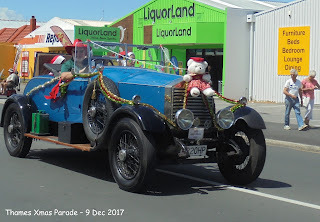 This had been a tough year for the town, floods earlier in the year, while the Great War continued claiming the lives of tens of Thames men each month. Nine Thames WWI soldiers are known to have died this month, one hundred years ago. The Kings message to the troops in 1917 wished all good wishes for Christmas and the New Year. "Our Christmas thoughts are with you, the sick and wounded soldiers and Sailors. We know by personal experience with what patience and cheerfulness their suffering is borne. 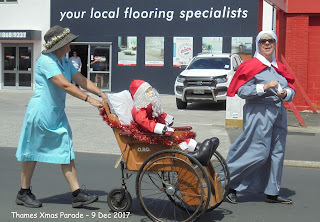 We wish all a speedy restoration to health, a restful Christmastide, and brighter days to come - (signed) George R and I and Mary R."
The Thames Star 24 December 1917, had a four page supplement devoted to Christmas. 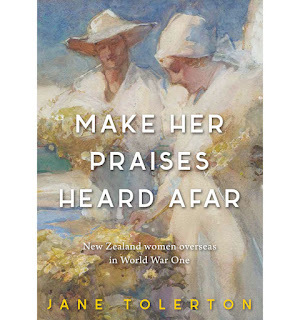 From poems to general stories, for young and old, a wide range of topics included. 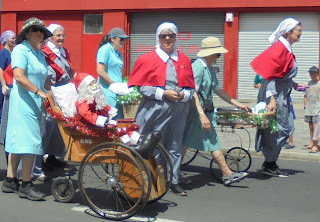 Such as: The Story of the Nativity; Origin of the Maori; to poems such as Santa Claus. Link for page One, Two, Three and Four. 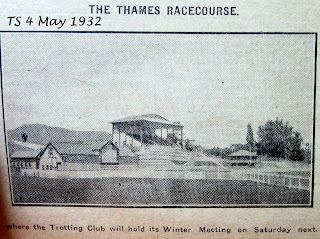 There is even a picture of Thames 'today' 1917. Sadly the quality is poor, but a popular view looking south along Pollen Street. 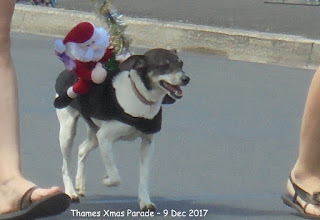 On 25 Decmeber 1917 there were special Christmas Church services in the town, while many eagerly awaited the Thames Race meeting on Boxing Day. The highlight for many churchgoers occurred on the 23rd December when the Baptist and Congregational Church used their newly installed electric light for the first time during the evening service. When you come by a 'new' postcard, there is always the hope that an interesting story will be revealed on the back. 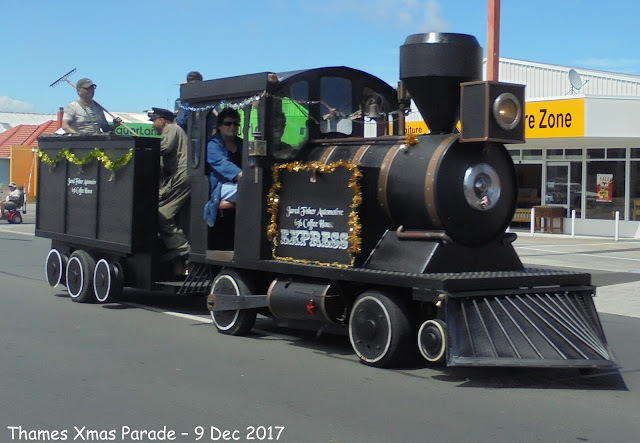 The picture on the 'front' is just the bonus. 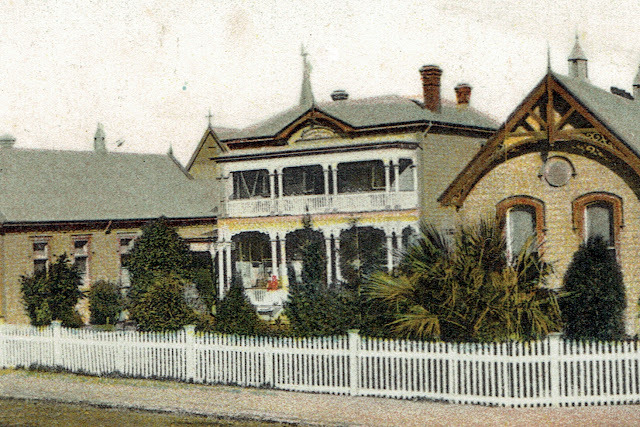 This postcard is very detailed in colour, while there appears to have been the joining of two photographs given the optical bend in the footpath and fence in the lower centre of the card. For those unfamiliar with this building, this is the 1900 hospital built facing Baillie Street. Looking from left to right, there are two ward blocks, the two storied building in the middle is the entrance and administration/communal areas. Then there are a further two wards. 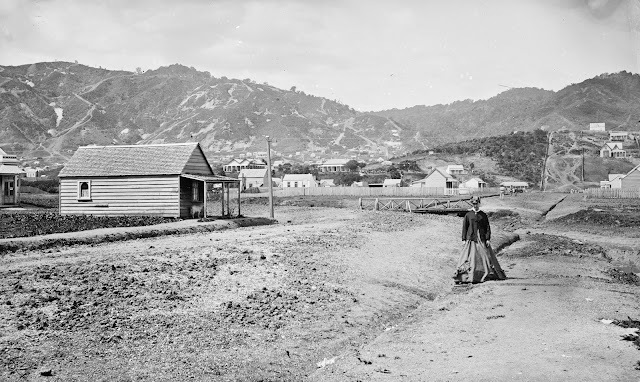 To the right would be the Medical Superintendent's house, then the Karaka Creek. 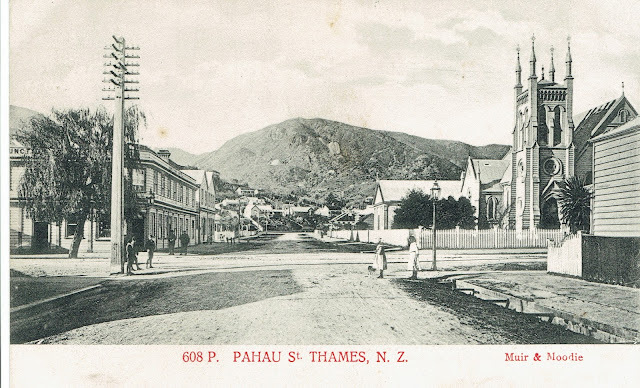 The postcard was addressed to Mrs A D (or G D) Bennett of 39 Hope Street, Dunedin. The message reads: "Many thanks for letter & enclosure received yesterday. Will send jacket later on. All good wishes for a happy Eastertide. (Signed) N. C."
The stamp used was a halfpenny 1900 pictorial (green) of Mt Cook. Sadly the postmark can't be read to find out exactly when the card was posted. In the 1902 Street Directory, the house at 39 Hope Street is occupied by Mr Edmund Cook, the Chief Postmaster; so sadly doesn't reveal anything on the identity of Mr or Mrs Bennett. By 1910, Mrs E Boyer resides in the house at No 39 Hope Street. So no definite identification of the Bennett's at this stage! 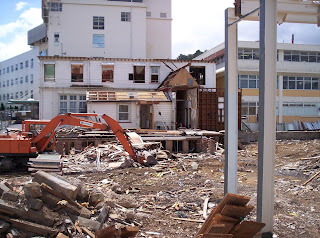 The remnants of this old hospital were finally demolished in 2008, to make way for the new Clinical Services Unit at Thames Hospital. ABOVE: Left - Looking down on part of the old 1900 Baillie Street Hospital building. Right - 2008 view of the demolition of the buildings viewed from Mary Street. Wowww!!! 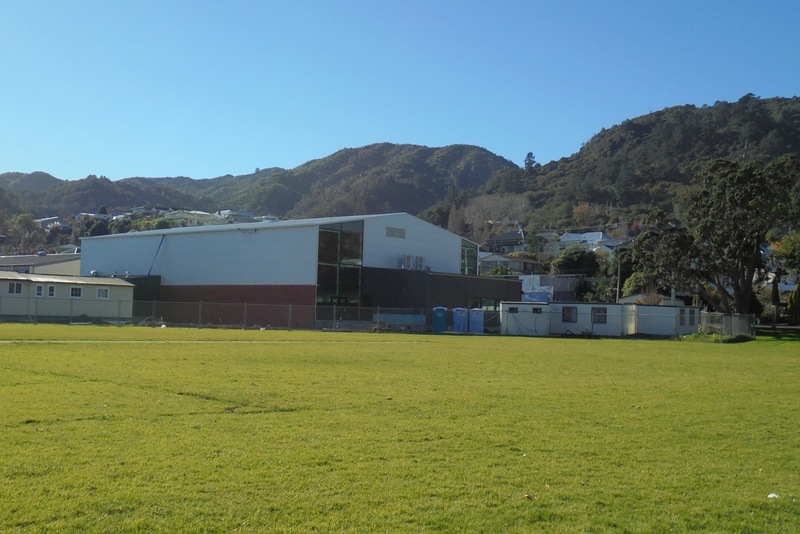 I was so thrilled to see this press release from the Thames Coromandel District Council this morning - giving details of the naming of the new recreation centre adjacent to the Thames High School Gymnasium. The centre is to be called the JACK MCLEAN COMMUNITY RECREATION CENTRE in honour of the late Jack McLean. Jack was a true Thamesite who went on to be an All Black and a rugby league star in England in the 1950s. John Kenneth (Jack) McLean was All Black No 473, a wing three-quarter, he played five matches for the All Blacks (two Tests); a member of the Thames United Club, Jack played for the Auckland Rugby Union of which Thames was a sub-union. 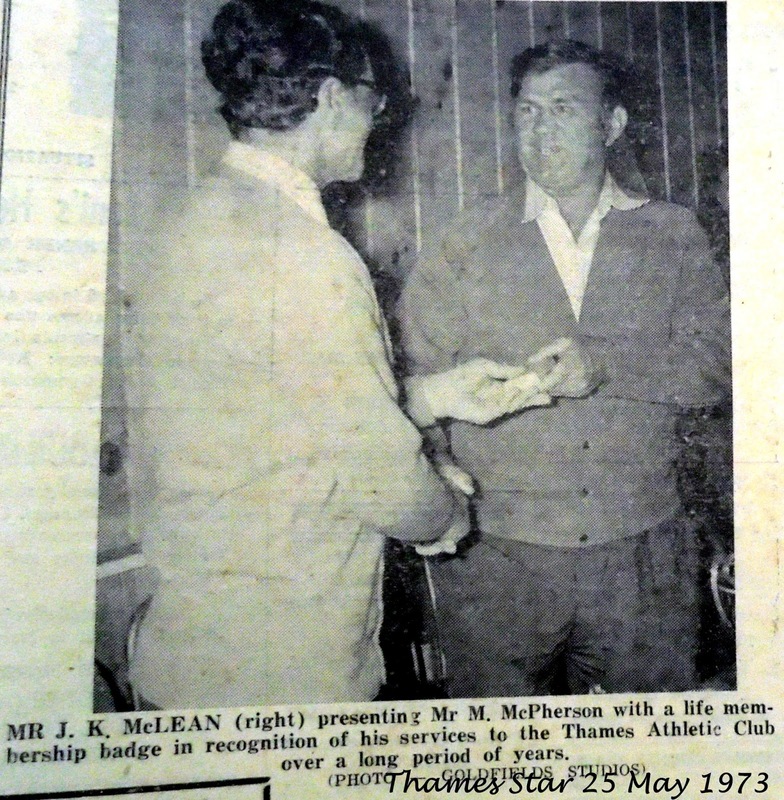 Many will have been taught at Thames High School by Mr McLean, and fittingly his 1970s classroom in A Block would have been close to where the new recreation centre is today. 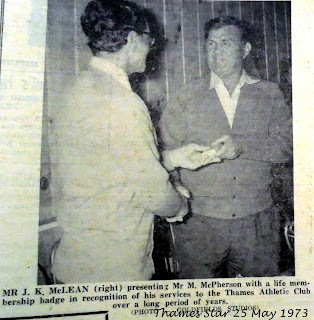 Jack took a keen interest in many sports, for instance he was a member of the Thames Athletics Club in 1973, when Mr M McPherson was presented with a life membership. (photo right) He also coached rugby while at Thames High School. 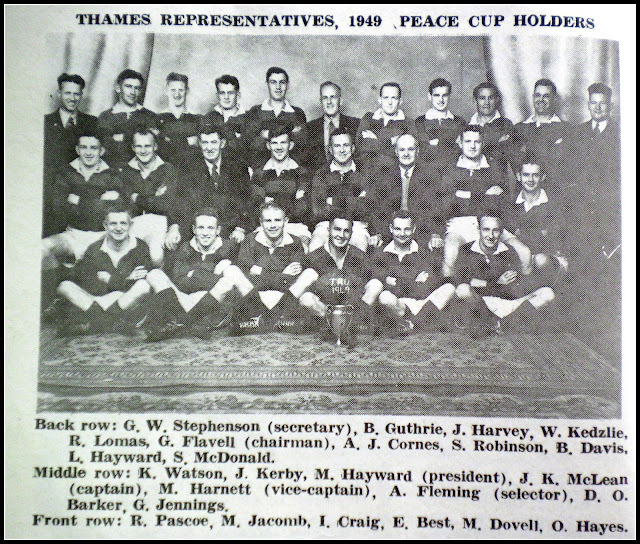 The glory days of Thames Rugby, Thames was Peace Cup holders at the time! 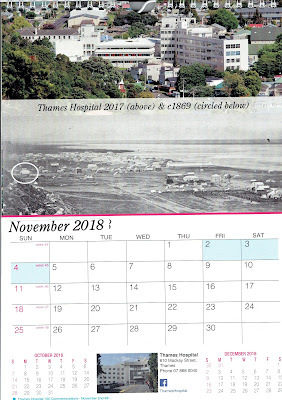 The Thames Hospital 150 Commemorative Calendar is available for just $10. Well, when you least expect it, another very original book about the greater Thames-Hauraki area. I was surprised walking into Carson's Bookshop today to see a book that had completely gone unnoticed by me...obviously not by many, as apparently it has been flying off the shelves!! Anyone with a farming background, interested in transport or just history in general will find this a very interesting read, and trip down memory lane. Plus the book provides an excellent overview of the history of transport through the Thames valley during the 20th Century. 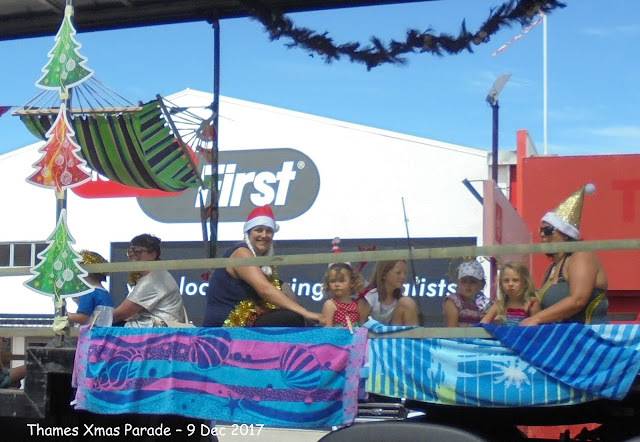 The town was packed today waiting for the annual Xmas Parade. Roads were closed along Pollen Street, while crowds gathered on the edge of the footpath, all wanting the best vantage point. 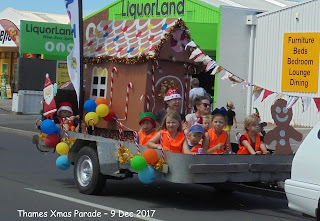 The parade itself took over 30 minutes to pass by, with lots of lollies distributed to children young and old. 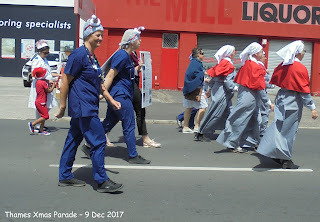 The parade started at Grey Street at the south end of Pollen Street, and those participating must have been exhausted after the mile trek to the Grahamstown end of town. 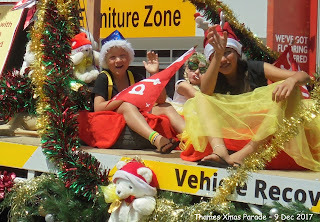 A selection of photographs feature below, while a full set is on the slideshow. 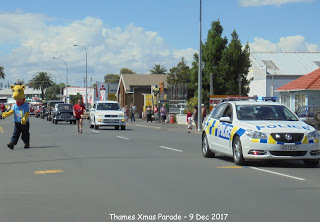 Above: The Police Car's siren signals the beginning of the parade at 11am. 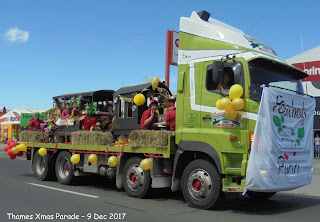 Schools from country and town were spread through the parade, aboard transport trucks - one of G Wright's trucks above. The band played, along with several other musical groups. 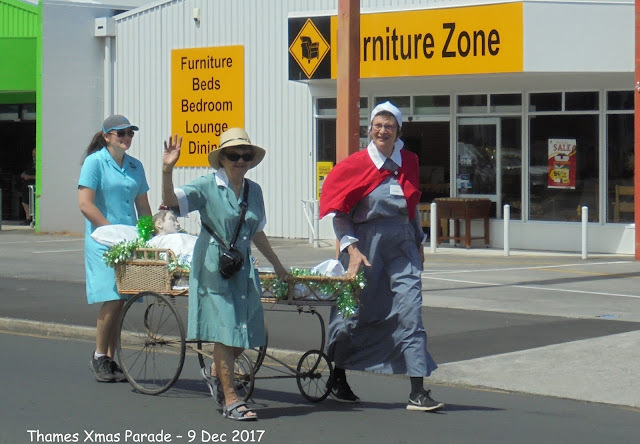 Thames Hospital chose the theme of uniforms through the decades. 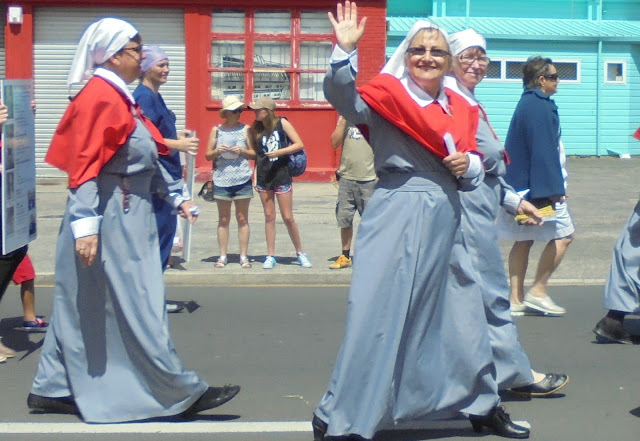 With different uniforms worn to represent nursing and cleaning staff. 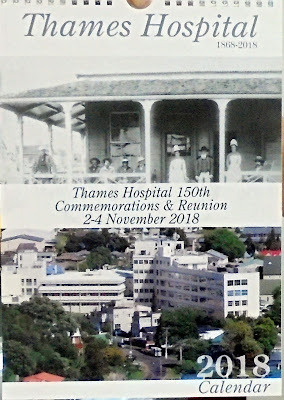 This was in preparation for the Thames Hospital 150 Commemorations 2-4 November 2018. 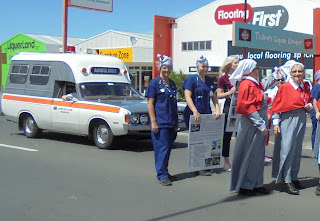 The WWI Commemorative Nurses have featured in many parades since the start of the WW100 commemorations. They share a special place in our hearts at Thames, given the number of World War One Nurses who trained and worked at the Thames Hospital. There were several animals in the parade, many associated with the SPCA Float. 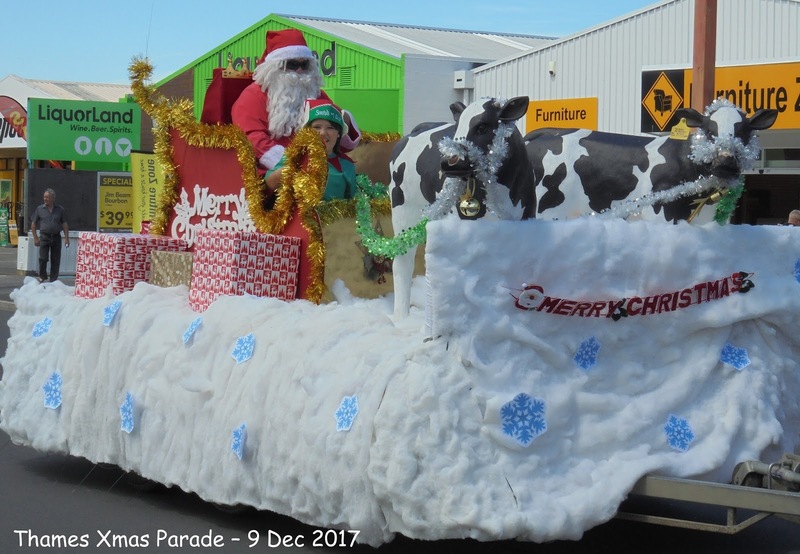 Always a popular addition to the parade, going back to when Mr Johnny Paynter always entered it into the parades. Now it has been given a makeover and proudly runs thanks to Jared Fisher Automotive. 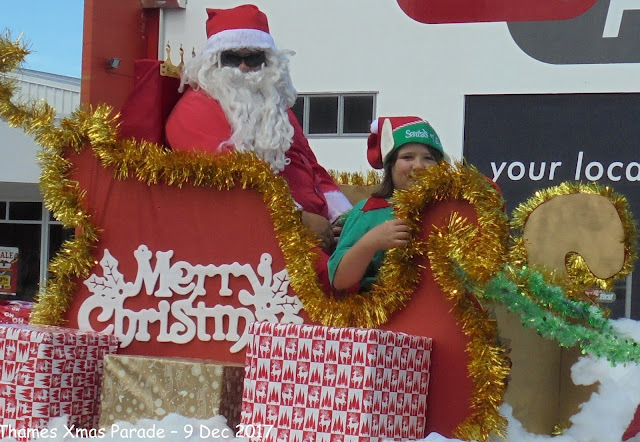 The star of the show, Santa Claus brought up the rear of the parade.